Jerusalem - Israeli Prime Minister Benjamin Netanyahu has told U.S. Secretary of State John Kerry that Israel will begin a 12-hour pause in Gaza hostilities starting at 7 am Israeli time (12 a.m. EDT) on Saturday, a U.S. official said on Friday. The official, who spoke to reporters on condition of anonymity, made the comment when asked about Kerry’s earlier statement on a goodwill gesture by Netanyahu at a press conference in Cairo. Why is Israel always asked to make "goodwill gestures" towards the bands of terrorists ?! And more so why does Bibi always cave in and do it? Forget about what the Umos Haolam think and say, you will never get their approval anyway, no matter how many self destructive gestures you make towards them, it will be never be acknowledge or appreciated! Just defend your own people and stop kowtowing to the enemy! Makes one wonder what went on behind the scenes. 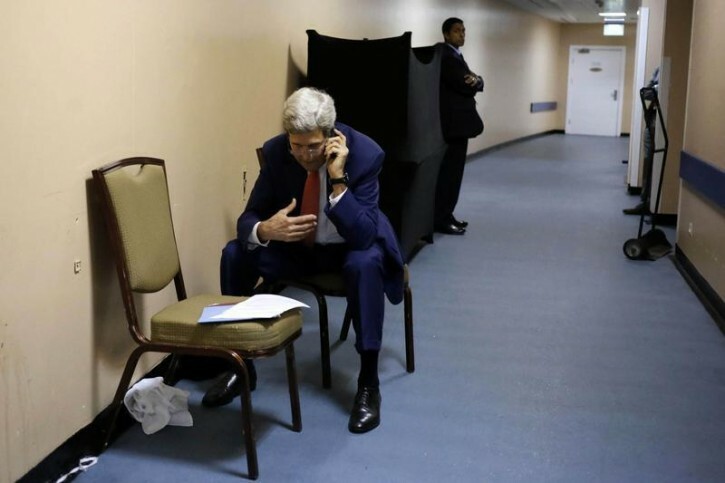 Did Kerry blackmail Bibi with threats to ban flights again etc.? Your second question answers your first. Why is Israel ask to act in a way that makes winning the war almost impossible? Because Israel almost invariably buckles under and does it. First of all I've never heard of such thing as "unilateral ceasefire." It has a ring to it of committing suicide. And what is the purpose of any kind of ceasefire when our side has the initiative? To let our enemy regroup and reload? Our IDF boys in Gaza need a shabbos rest !